The Blast Zone features adventures in High Power and Experimental Rocketry. May 2010.Fire in the Sky 2010 - rockets in the air! July 2006. A new spreadsheet that will calculate propellant a, n and ISP* values from test burn data. July 2003, Brothers, Oregon. 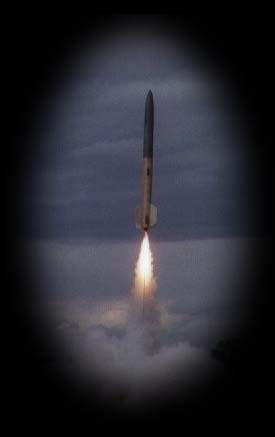 Flight of Stratosphreak 2 on a 14 second burn D grain 98mm M.
June 2003. New experimental solid propellant simulation software released, BurnSim! Sept 2002, Nevada. BALLS 2002 Tripoli National Research launch. 7 motor 38mm cluster, min dia N, min dia M, and other such craziness! August 2001, Oregon. My level 3 flight - Success! May 2001, Utah. A trip to Thiokol for an SRB burn and the NSL. May 2000, in Brothers, OR. Many Research flights and my Level 3 attempt with Carbon Black. March 2000, in Dayton. The Triad goes up on a cluster of 3 H180's, and comes down without a main chute. Fillible 99 at Millican, Oregon. One day, one flight, one lost rocket. The Sonic is MIA after a great flight on a Kosdon K350. Balls 99 at Black Rock. THE experimental launch! The Megaroc dies a gracefull death, and adventures on the Playa. At Millican, the Pine Mountain Rocketers put on a great launch, and even let us fly some Researchmotors! Badger Flats Launch at Moses Lake. The only launch at this wonderful launch site. The raptor rips it up on a couple of H's, and the Megaroc goes the distance on a K700. Early Big Ugly Launch Pics. Found these laying around, realized they weren't on the site. Blast Zone Archive When changes happen they are listed here, then sent to the archive.